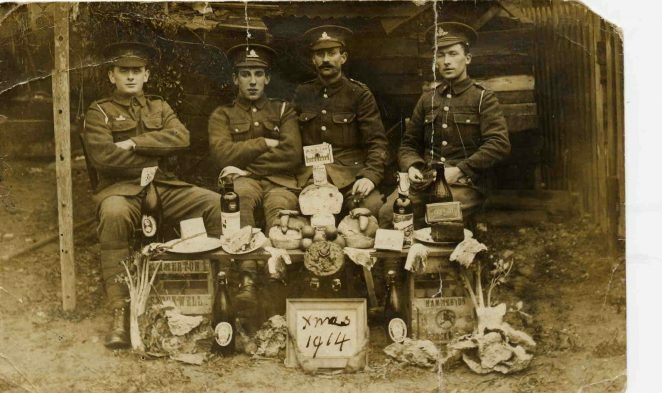 Christmas in the Royal Horse Artillery, 1914. Frank Romaine is the one with the moustache. The 1891 census shows that Frank Romaine was born at Brighton in 1888. Exactly where in the town is not known but believed to be Newark Place where he is shown at the age of 3 years. 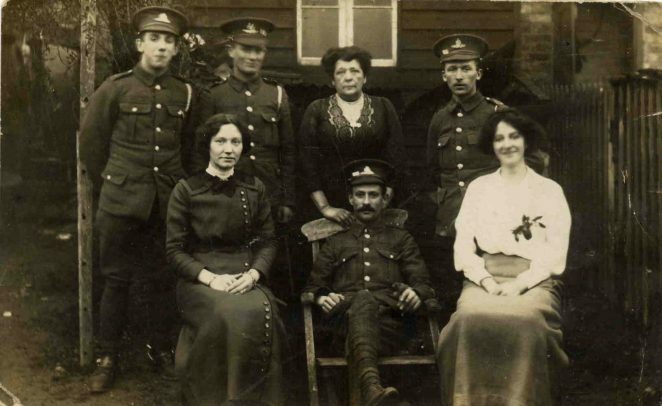 He enlisted in the Royal Horse Artillery and saw service in France during WWI then later in Mesopotamia. He married Charlotte (Lottie) Romaine in 1915, presumably during a spell of leave and had a family of 2 girls and 6 boys. His second daughter, Joy married me, Ron Spicer all of which is commented upon elsewhere. Frank was a consciencious member of society and at the outbreak of WWII went to work in a munitions factory, later returning home and becoming a member of the ARP. Typical of the men in those times, Frank exercised a certain positiveness in his family which often caused a little anguish in Lottie. He had a way about him which consisted of nearly always having a pipe in his mouth and when greeted would rapidly shift it from one side of his mouth to the other and utter a sound something like ‘humm’ and on my first experience of it I found it rather strange. We sorted out each other amicably on that one. Another trait was the cap wearing habit. His cap would hang on a peg by the front door and, whenever it was necessary for him to answer the door he would first don that cap. Such were the times! Frank Romaine is at the centre front. None of the other people in this ‘photo are known for certain although the lady behind Frank is believed to be his mother. My nan’s maiden name was Romaine. Sorry don’t know if these people were related to her, but will show this to my dad who is 80, so he may know something about them.